Carte Particuliere Des Cotes d'Italie Grand Duche de Toscane partie comprise entre l'embouchure de L'Arno et le Cap Castiglioncello. 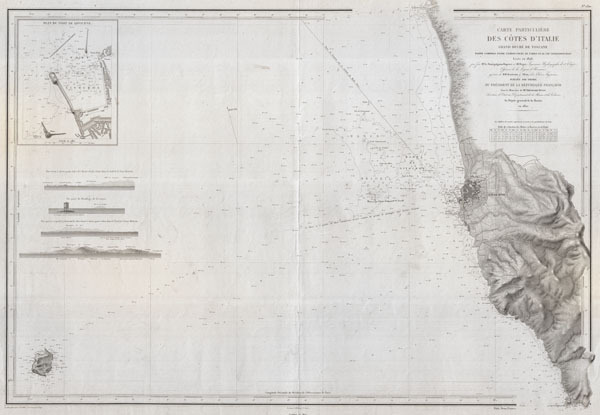 A beautiful French nautical chart or map issued in 1852 by the Depot de la Marine. Covers the Tuscan coastline from the mouth of the Arno River (Embouchure de L'Arno) to Cape Castiglioncello (just north of Pisa) with a focus on Livorno (Livourne or Leghorn). Offers sumptuous detail both inland at sea. Offers countess depth soundings as well as notes on undersea features such as banks and shoals. Equally impressive detail inland with beautifully engraved topography and detailed in Livorno proper to the level of individual roads and buildigns. On the left hand side of the map there is a detailed inset of the Port of Livorno as well as five coastal views. The island of Gorgona (Gorgone) appears in the lower left quadrant. Today Livorno is a popular tourist destination and a port of call for Cruise ships visiting Tuscany. Issued by Theodore Ducos for the Depot-general de la Marine in 1852. Very good. Minor annotation near Meloria bank.